'bread' 태그의 글 목록 :: Food Storyist. 2011.11.28 Korean Bread : Kingdom of Franchise bakery. Paris baguette and Tour les Jours. Korean Bread : Kingdom of Franchise bakery. Paris baguette and Tour les Jours. Korean Bread : Kingdom of Franchise bakery. Paris baguette, Tour les Jours. There were many ‘town bakeries’ around my elementary school. On the way home, I used to drop by different bakeries on each different day. Although the interior and decoration were not that splendid, haha, frankly speaking, rather old-fashioned, there oozed something warm. The owner baked the bread from early in the morning and prepared to sell them. They tried to make the best taste bread with the effort. They were not only owners but also earnest bakers. And they were kind sellers who remembered me and who were happy with the compliments about tastes. Sometimes, they do gave perks to their regular customers. Korean’s affection 정 lived in it. The town bakeries were different from store to store. Some town bakeries have a particular kind of bread, but others do not. Some town bakeries’ owners are an old, plump man, others a young lady, an old grandpa, grandma and so on. The tastes of bread were not guaranteed, so some bread were not delicious. Of course, some bakeries have the worse sanitation compared to franchise one. Differences were not all good things, but bad as well. But people always miss something that they cannot get. In that way, I yearn for that difference. This picture is. the diversity. When you walk on the street of Korea, you can easily find the bakeries in Korea Although the main dish of Korea is rice, we do eat bread quite aften anytime in Korea. But you might think that there are just few kinds of the bakeries in Korea, Paris baguette, Tour les Jours. If you come from the countries that eat bread every meal, you should have noticed as soon as you arrived in here. Since one of fourth of Korean bakeires are run by these two franchise companies. decreasing, while the franchise bakeries increasing. According to the statistics on the newpaper, self-owned bakeries have diminished from 17,000 to 5000. The number of franchise has recorded 3,000 and number two, Tous les Jours almost 1500. Let's ask about the biggest franchise bakery, Paris baguette to Mr. Wiki. 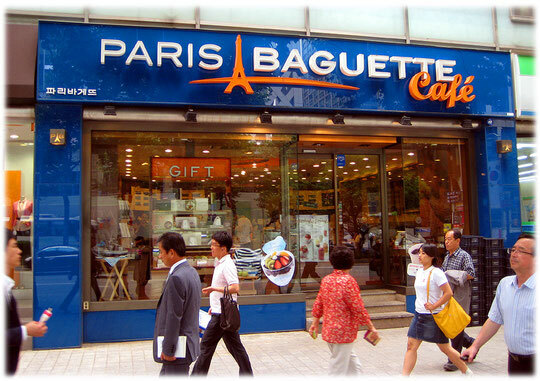 Paris Baguette is a division of SPC Group, an international food and food services company based in Korea. Paris Baguette ranks as the top brand-based on brand recognition and brand power- in the highly competitive Korean Bakery market. Paris Baguette presently supplies fresh bakery products to customers through 2,900 stores in Korea, and 50 stores in China. Paris Baguette currently operates 15 stores throughout the United States, in California, New York, New Jersey and Pennsylvania, There are 7 more stores that are planned to be opened by the end of 2012.The brand’s management philosophy focuses on educating its employees with offering the highest quality products with only the freshest ingredients and the best customer service. I found the introduction of Tous les Jours on its webpage. When I enter the franchise bakeries, I can see young staff serving me with a huge smile, well-designed interior made by professionals, fine bread arrangement, good sanitary system, and trustful bread quality. All of them I love. This picture is. the standard. But instead of trained smile, I miss my old neighbor. Instead good looking store, I want to owner’s interior sense. Instead of high-standard bread, I want to try bomb tasted bread, maybe one of owner’s experimental results. I hope someday there will be more various colors of bakeries with baker’s warm smile on the street. How come franchise bakeries dominate the market? The primary reason is the principle of free-markets and the lack of craftsmanship in bakery business. First of all, as industrialized, the products got mass-produced to reach high productivity and efficiency. The entrepreneur emphasized on rather the profits than the quality. It leads to the mass-produced bread. Later that, the market desired fresh bread made from the store. It seems the business flow changes to fresh bread. There appear diverse self-own bakeries on the street. We usually call it ’town bakery’ 동네빵집 in Korean. However, the advent of the franchise system, people began to be accustomed to standard products that always provide average quality, different from self-owned bakeries that do not guarantee the taste. It can be said ‘McDonald advantage’ with the advantage of franchise system, those bakeries have widely spread throughout the nation. The systemized stores easily followed the trend of the market, so attracted more customers and generate more profits through the organized management system. The owners of small bakeries transferred to franchcise ones since they became inclined to simple operation and warranted earnings. Through this way, these ‘big dinosaurs’ massacred ‘small town bakeries’ with the economy of scale. 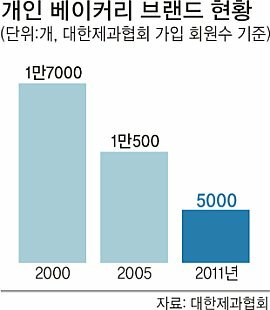 As a result, in Korea, almost half of bakeries are franchised by companies. Furthermore half of these franchised bakeries are run by two carnivore dinosaurs, Paris Baguette and Tous les Jours, offering standard and common taste to customers. Secondly, No or less craftsmanship. There is a saying in Korea that ‘If you have nothing left to do, you own a restaurant.” As you can vaguely feel, it covers the neglecting perspective for workers in food field. Although the chef’s status has much leveled up compared to 50 years before, this notion still lies in Korean. After people retire, they still want to work but nowhere to work, so they start up bakery business. Based on that notion above, considering their own business, they first come up with restaurant business, but they got depressed by the budget issues. Fortunately, compared to the restaurant, the bakery opens with small budget. It dragged retired workers to the bakery business. So Different works, Aren't they? Here, the critical issue occurs because of the owner’s mind, rephrasing, the lack of craftsmanship. Most of bakery owners are not bakers or they do not even know what the yeast is. Of course, they might get trained in skills and know-how by headquarter training centers, but they might not have mind-set. The primary purpose of running the bakery is earning, not selling good bread. For them, the bakery is their job, not their vocation. They get satisfied if they get profits through the business and do not think about the quality, taste and do not study bread. Is it really the development of Bread industry? Since 1960, the bread market has expands, so the bread industry has got bigger. However, I do not dare to say that the bread quality improved. Under the governance of two major bread companies, the bread become standardized and normalized since they study the common taste for general customers. There is no experimental bread that had existed in the ‘town bakery’ that just targeted a few customers in the neighborhood. No diversity. 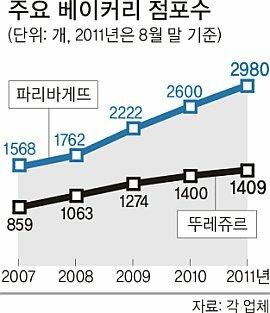 That is exact word that describes Korean bread market. Few days ago, Paris Baguette announced that the number of franchisee store exceeded over 3000. They do reluctantly publicize that fact, since they assumed that the citizen will not be happy with that. It means customers also become aware of the monopoly of Paris baguette that leads to restrain of customer choices. As the situation worsens, people began to wriggle. Some, who study in France and Japan and study real French or Japanese baking skills, open their signature bakeries. They aim to be noble bakery and tend to put high price on bread, but have diverse varieties of bread and good taste. I think the market trend always changes interacting societal changes. The monopoly of bread market in the current market is not that welcoming. But, One day, consumers must pursuit another values on bakeries and it will affect the bakery industry. It means that it is also one stage to transform to the more diversified and professionalized bakery. Just personally, I hope the change comes very soon because I am quite fed up with common bread.